On December 15th, the Rosewood team participated in our annual company Volunteer Day. 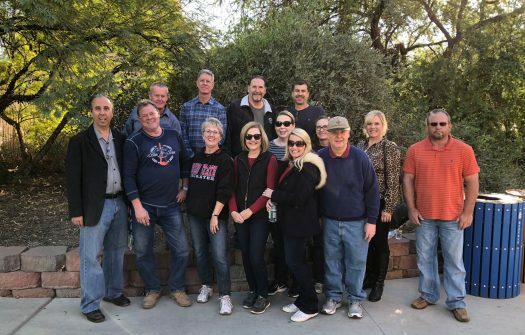 This year, we headed for the Phoenix Zoo, where we completed landscaping work including removing weeds, non-native shrubs and trees. For those who might not know, the Phoenix Zoo has a horticultural staff of just nine people who are responsible for the Zoo’s 126 acres of grounds. They don’t have a budget or staff for anything but the most basic grounds keeping. So, projects like the ones we did simply won’t get done without volunteers. Though we appreciate how grateful Lenora and her crew are, we definitely feel like we got so much more out of the experience. After all, who doesn’t love the zoo? Each year Rosewood closes all of its offices to volunteer at a local non-profit or charitable organization. Past group volunteer events have included St. Vincent de Paul, Salvation Army, Children’s First Academy, South Scottsdale’s Vista del Camino Community Center and others. Let us know if you would like to nominate your non-profit for a possible future Rosewood Volunteer Day.